Target printing software. Over 500 pistol and rifle targets designed for printing from your computer. TargetExpress includes: IPSC, IPDA, NRA, ISSF, IBS, Military and LE, IHMA, 100 and 200 yard MOA sighting, standard pistol, and many other targets. Most targets are designed for 8.5" x 11" paper, with regular and ink saving versions. The TargetWizard option allows you to create your own targets. It allows you to scale targets out to 1000 meters. Most targets are designed for 8.5" x 11" paper. Most targets have regular, ink saving, and hi-visiblity orange versions. The new TargetWizard option allows you to create your own targets. 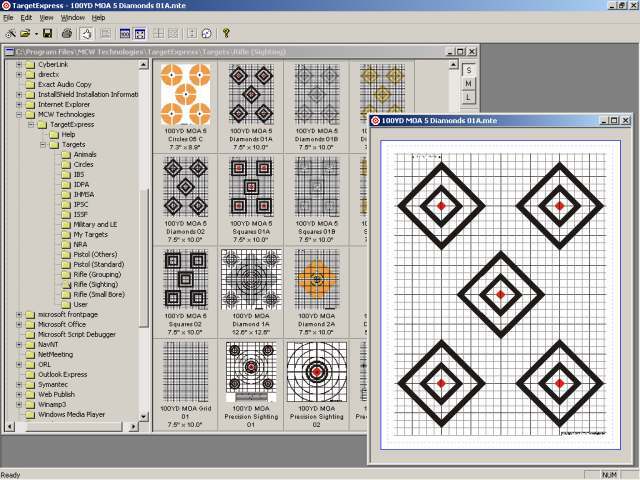 A new target tiling option allows you to tile small targets to fill a printer page. TargetExpress has a scale target for distance feature that can scale targets out to 1000 meters. For larger targets, TargetExpress will print tiled pages that can be trimmed and taped together to produce the full size target. Large targets can also be scaled down to fit any size paper. TargetExpress has a convenient build in thumbnail viewer to quickly view and select the targets you wish to print. Qweas is providing links to TargetExpress 4.20 as a courtesy, and makes no representations regarding TargetExpress or any other applications or any information related thereto. Any questions, complaints or claims regarding this application TargetExpress 4.20 must be directed to the appropriate software vendor. You may click the publisher link of TargetExpress on the top of this page to get more details about the vendor.